The Dakota, 9/30 and 10/1/07: Front porch music, back room music, roots music, music from Natchez downriver and New York out east, Olu Dara telling stories that open into songs, singing songs that pause for stories, the cornet's wail, feet tapping, Alonzo Garner on bass and Kwate Quartey on guitar playing a heartbeat of notes and chords, songs about love ("When the dark clouds come/Bluebirds fly in the nighttime/When you lose a love/A new love comes at the right time") and Uncle Levi's longing for white suspenders ("A promise is a debt") and a woman with lips like Louisiana plums ("Your lips, your lips are juicy") and a drummer named Massamba from the Congo. We're at the mercy of three wise men, one wearing a Bentley visor cap. When it's over, I don't know whether to laugh or cry. 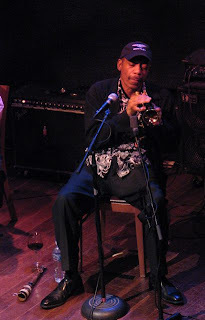 Janis Lane-Ewart interviews Olu Dara on her weekly KFAI radio program, "Collective Eye"